What is FHA insured mortgage? FHA (Federal Housing Administration) insured mortgage has always been a popular option for those who are struggling with bad credit and want to rebuild. Because it is easier to obtain this type of loan than many others, many people are turning to FHA as a way to own the home of their dreams. Federal Housing Administration was formed in 1934 to promote homeownership among Americans and to aid the formation of stable communities nationwide. In 1965, the FHA became part of the U.S. Department of Housing and Urban Development. The FHA has insured more than 34 million properties since its formation, and currently insures more than $1 trillion in U.S. home loans. The FHA is the largest insurer of home loans in the world. There are many reasons why FHA loans are popular among U.S. home buyers and refinancing households. One reason is that FHA loans allow for a smaller downpayment than comparable loans via Fannie Mae and Freddie Mac. The FHA will allow a 3.5% downpayment whereas most conventional loans require five percent, at minimum. A second reason why FHA loans are popular is that mortgage rates can be lower than for a comparable conventional loan. The FHA does not assess risk-based pricing for credit scores below 740; or for condominiums; or for 2-unit homes. FHA mortgage rates are sometimes 1/2 percentage point lower than rates for Fannie Mae loans. Lastly, FHA loans can be easier for which to qualify. Can I Obtain An FHA Loan If I Have Filed For Bankruptcy? Yes! FHA is one of the loans that are forgiving of the past. They require that the borrower have two years since the date of discharge and have little to no credit problems since the bankruptcy was final. Any credit problems after the discharge can be a problem, as they show a poor payment history. What Type of Credit Score Do I Need For An FHA Loan? FHA finances the future and not the past. They want to see that a person has made an effort to improve their credit. An FHA mortgage is easier to obtain than others, but they still have guidelines. Typically, they like to see a credit score of at least 630. Higher credit scores are always better, but the interest rate will be the same regardless of a credit score of 650 or 800. How Much Will I Need Down For My Home Purchase? Unlike other lenders who will ask for 20% down, FHA caters to those who have challenged credit and are rebuilding. They ask for 3.5% down on all loans. This is a small amount but keep in mind there are other costs associated too. The buyer must pay closing costs and that can also be a large chunk of money. Home loans that ask for large chunks down are often hard to obtain and require people to take out a second mortgage to cover the down payment. FHA is a fixed rate and one of the best loans around. What If I Have Had A Foreclosure? If you had a foreclosure in the past it doesn’t matter. It looks better on you if the home was included in a bankruptcy, but it doesn’t have to be. There is a three year waiting period for owning any home in your name. You cannot have another mortgage in your name and get an FHA loan and it must be your primary residence. A home purchase for a rental property is not an option with FHA. Regardless of what the situation, FHA needs to see there have been no homes in your name for the past three years. FHA-insured homes must exist as a single, marketable piece of real estate. A loan, therefore, may not be secured by a bedroom or kitchen within a given home. It may only be secured by the entire home. An FHA-insured property must be accessible without trespass on an adjoining property. If the property is not directly accessible via public ways, an easement must be associated with the property to provide direct access. FHA-insured homes must be accessible for a pedestrian or vehicle from a public or private street with an all-weather surface. If the access street is privately owned, it must be maintained by a homeowners association or via agreement with other homeowners. 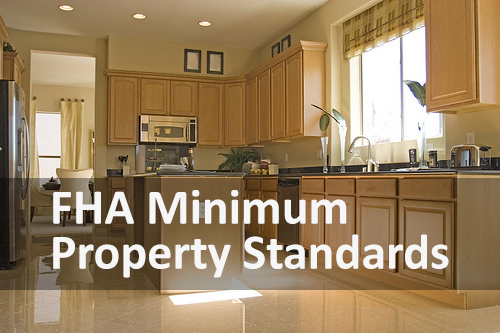 The FHA requires that its insured homes be free of health and safety hazards. This may include excessive pollution, radioactive materials and mudflows, among other hazards. If these hazards exist, homeowners can provide evidence that their risks have been mitigated and re-submit to the FHA for approval. FHA mortgage guidelines require that structures on a property, or at a property line, be separated from adjoining buildings by a full-height wall. If the full-height wall is an outer-most exterior wall, the FHA requires that there be enough space between buildings in order to perform wall maintenance, as needed. FHA-insured properties must be graded so that water drains away from building perimeter walls, and so that water does not pond on the property. The FHA requires that its insured homes be free of defective construction, poor workmanship, evidence of continuing building settlement, excessive dampness, leakage, decay, termites or any other condition that impairs its safety, sanitation or structural soundness. FHA-insured homes must have a roof which is water-tight and shows no evidence of missing tiles, shingles, or flashing; or signs of leakage. An FHA-insured property must have adequate space for living, sleeping, cooking and dining. It must also have sanitary facilities including, but not limited to, bathrooms with showers and/or bath tubs. An FHA-insured property must have a continuing supply of safe drinking water, sanitary facilities, a safe method of sewage disposal, adequate heating, indoor hot water, and electricity for lights and equipment. Water, gas, electric and sewer services for an FHA-insured properties must be independent for the property, with no dependence on another property. In a multi-unit building of 2-, 3-, or 4-units where utilities are shared among owners, each unit must maintain a separate shut-off switch for its utilities. Common services including laundry facilities, storage space or heating, are allowed. The attics and crawl spaces of an FHA-insured home must have proper natural ventilation to reduce excess heat or moisture that can lead to structural decay or deterioration. Crawl spaces must be accessible and clear of debris.